Bloomberg has today published a report in which it claims that Apple is working to ship an Apple Watch with a built-in EKG monitor in addition to its existing heart monitoring capabilities. Right now the watch already features an all-day heart rate monitor that tracks a wearer’s beats per minute, but third-party accessories are required if EKG functionality is required. Bloomberg’s report goes on to explain how the EKG feature apparently works on a version of the Apple Watch that is currently in testing within Apple. A version being tested requires users to squeeze the frame of the Apple Watch with two fingers from the hand that’s not wearing the device, one of the people said. It then passes an imperceptible current across the person’s chest to track electrical signals in the heart and detect any abnormalities like irregular heart rates. EKG, or electrocardiography, is generally used in hospitals to allow professionals to detect if a patient has experienced a heart attack or stroke following irregular heart beats. 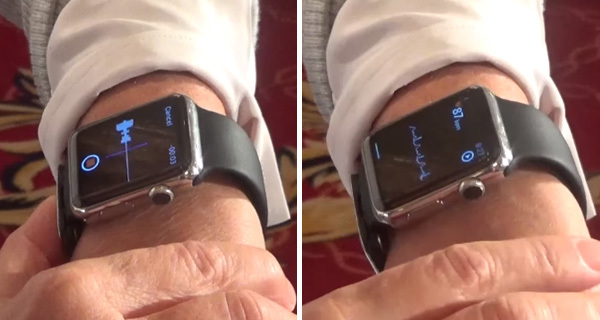 An Apple Watch can today already detect that irregular heartbeat, but the addition of an EKG reading feature would take the watch’s already impressive health monitoring capabilities to a whole new level while removing the need to buy an accessory for those who want to have the ability to have an EKG reader on their wrist. While an Apple Watch with EKG functionality is in testing, according to Bloomberg, it is still possible that it will not move beyond that stage. Apple tests lots of features when designing new or updated products, but given the company’s fondness of putting the Apple Watch in a position as a grade-A health monitoring device, we would be surprised if this is one feature that does not make it into production.